Communication for Healthy Living (CHL) was the United States Agency for International Development in Egypt’s (USAID/Egypt) integrated social and behavior change communication activity, implemented from September 2003 to December 2010. It was iImplemented by the Johns Hopkins University Center for Communication Programs. To develop institutional, technical, and financial sustainability to implement health communication programs in the public, NGO, and commercial sectors, as well as to establish enduring public demand for good health. These objectives were to be met through collaboration with three sectors: the public sector, the nongovernmental sector, and the private/commercial sector. Each sector was to be partnering for specific aspects of the program.These objectives were to be met through collaboration with three sectors: the public sector, the nongovernmental sector, and the private/commercial sector. Each sector was to be partnering for specific aspects of the program. CHL was the first project of its kind in Egypt, addressing multiple critical health issues at multiple key stages in life. It also was unique in that it used multiple communication channels, all under the umbrella of a unified communication campaign with a unified theme and a set of messages written by consensus of leaders across the sectors of society. The approach succeeded in encouraging Egyptian families to adopt healthy behaviors in critical areas that had clear positive impacts on their health status. An important objective of the CHL project was to build sustainability for health communication by building capacity in all sectors of Egyptian society, throughout the entire system. This meant working with entities in the public or governmental sector, in the private or commercial sector, and with non-governmental organizations (NGOs) in civil society to build their capacity to implement health communication activities. The project was comprised of two components- the public-sector component was called Your Health is Your Wealth (or Sahetak Sarwetak) and ran from 2004 to 2011. The private-sector component, AskConsult, directly trained private-sector pharmacists in interpersonal communication to build their capacity to fulfill customers’ demand for credible health information. In order to facilitate this objective, at the beginning of the CHL project in 2003, CHL facilitated the establishment of an Executive Steering Committee (ESC), chaired by the MOH, with representatives from the State Information Service (SIS) and multiple sectors within the Ministry of Health (MOH). The purpose of the ESC was to oversee the strategic communication function: that of identifying health priorities, of developing annual plans to address them, of budgeting for the work-plans, and of coordinating inter-sectoral activities when beneficial. In this Spotlight, we describe the strategic SBCC design process and also describe the capacity strengthening activities undertaken by the project in each stage. 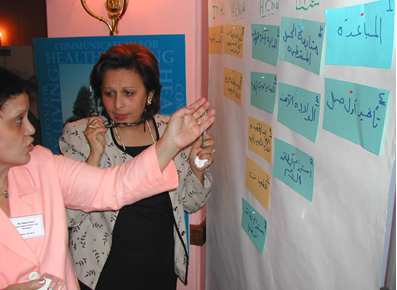 CHL's strategic communication programs were based on evidence from population-based surveys such as the Egypt Demographic and Health Surveys (EDHS). The team reviewed relevant research on health and family structures in Egypt. According to the 2005 EDHS, as well as findings from a population-based survey conducted by CHL in 2005, they found that several key family planning (FP) and maternal and child health (MCH) indicators had substantially improved, yet there were cohorts who lagged behind. 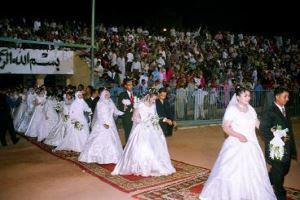 Family planning: Fertility rates had been steadily declining in Egypt from 5.3 in 1990 to 3.5 in 2000 and approximately 60% of women of childbearing age were using modern contraceptives. Maternal and child health: Women were also becoming more likely to attend at least four antenatal visits and to have medically assisted deliveries than in the past. Non-communicable diseases: While FP and MCH behaviors were on the increase, non-communicable diseases associated with unhealthy diet, lack of exercise and smoking accounted for a larger proportion of deaths. Household structure: Egyptian families are large, with residents of widely varying ages. The entire program was evidence-based, making use of available data sources, secondary analysis, and baseline and post-intervention surveys on the national and focal governorate levels (see more information below in the Mobilization and Monitoring section). Much of the strategy was developed at a Strategic Planning Workshop held in 2003 (see photo). The workshop highlighted new concepts of strategic health communication and built consensus around current Egyptian health priorities. Participants adopted for the first time an integrated cross-cutting family health model and jointly identified health priorities for all sectors. The framework shows both the top-down and bottom-up dimensions of the health program. From the top down, national health priorities and the vertical service delivery programs sought to “steer” messages toward the household, with the recognition that the specific behaviors being promoted represent signs of a “healthy family.” From the bottom up, it is clear that the framework recognizes that the household is the main actor in demanding health information and services, driving the program. CHL therefore placed control in the hands of families and communities through greater use of civil society organizations, community-based programs, and support to people’s health-seeking efforts to “pull” services through local health and information providers. 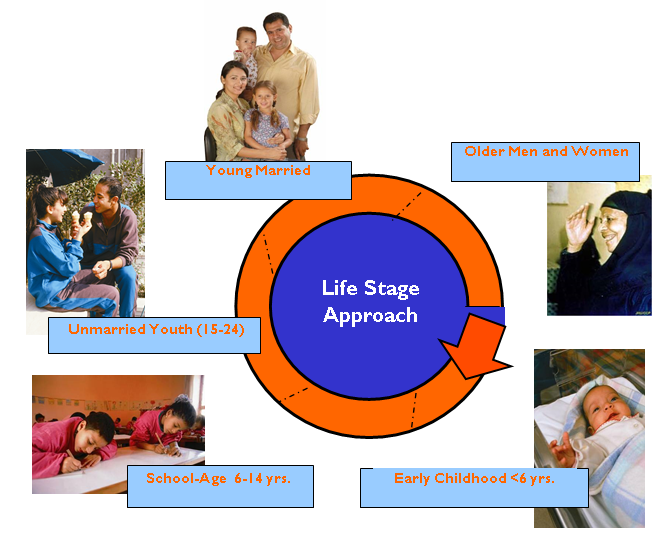 CHL also operationalized the family focus of the program through a Life Stage approach (below) which segments the family according to the age- or stage-appropriate needs of each member, addressing the household as a key decision-making unit. At the same time, this approach addresses the needs of entire age cohorts in society allowing for message campaigns relevant to the population as a whole. The strategy for managing the project was titled the "multisectoral and partnerships strategy," designed to position the Government of Egypt (GOE) as both the umbrella organization and partner of all institutions engaged in health communication, providing guidance on messages and monitoring accuracy. Recognizing the maturity of the GOE health communication program the management strategy was designed so that each of the major organizations played key roles within each sector, building on their particular strengths, shared interests, and diverse sources of revenue and support. CHL's strategy to engage the private sector, AskConsult, was aimed at “growing the market for health,” by increasing the public’s demand for health information. The strategy also included increasing health-seeking behavior and appropriate health products, and increasing the private sector’s participation in supplying resources and expertise for the provision of health information and promotion of healthy behavior. Based on the recommendations of the Strategic Planning Workshop, in February 2004 CHL organized a training of trainers (TOT) for selected cadres from MOI/SIS, MOH, and Save the Children from both central and local levels to build capacity among a core group of master trainers. In June of 2004, a Message and Materials Workshop for MOH and SIS representatives determined the content of the health messages classified by health topics and directed toward specified population segments. As another initial step in the creation process, CHL engaged an advertising agency to develop a unifying slogan that communicated the value of good health and cut across all health issues. Based on the deeply held cultural belief in Egypt that health is a gift that should be cherished and protected, the agency came up with the slogan “Sahetak Sarwetak,” or “Your Health is Your Wealth.” The slogan tested well with Egyptian audiences and became the catchphrase for all campaign messages, from hygiene to family planning, over a span of seven years. CHL decided to focus on the young married life-stage audience, since this audience is the entry point for family planning and maternal health, and are the caretakers of infants and children; some 37% of married women fell into this life stage. The Mabrouk! Initiative gets its name from the Arabic word for “congratulations,” reflecting the celebratory spirit of the key life events - marriage, childbirth, successful birth spacing and child-raising - while emphasizing the promise of a lifetime of family health. The signature TV spot featured a marriage party on a boat, with parents and friends wishing the couple, "Mabrouk! (Congratulations), Happiness and Good Health!" The message positioned health as both a desired goal and a responsibility, and modeled parental and social support to young couples making family health decisions, including family planning. AskConsult was the private sector component of CHL, aimed at “growing the market for health.” Growing the market for health meant increasing the public’s demand for health information, health-seeking behavior and appropriate health products; and increasing the private sector’s participation in supplying resources and expertise for the provision of health information and promotion of healthy behavior. Strategically, the AskConsult activity assembled multiple communication channels to create a platform for unified health communication campaigns. Those channels included TV and radio advertising, public relations events, the web, provider- and client-educational materials, sales promotion visits to pharmacies, pharmacists’ training, and community outreach. The first campaign launch event took place in Zohra Village, in the Minya District, in March 2004. The Mayor held meetings to mobilize support among men including community and religious leaders (photo below). An "Arab Women Speak Out" (AWSO) workshop was held in the same month among women of the area, to develop ways to incorporate the AWSO lessons learned into health messages. The initiative was implemented on a national scale as well as in underserved communities, using a full spectrum of communication approaches from mass media and publicity events, to community mobilization and empowerment, to client-provider counseling support. 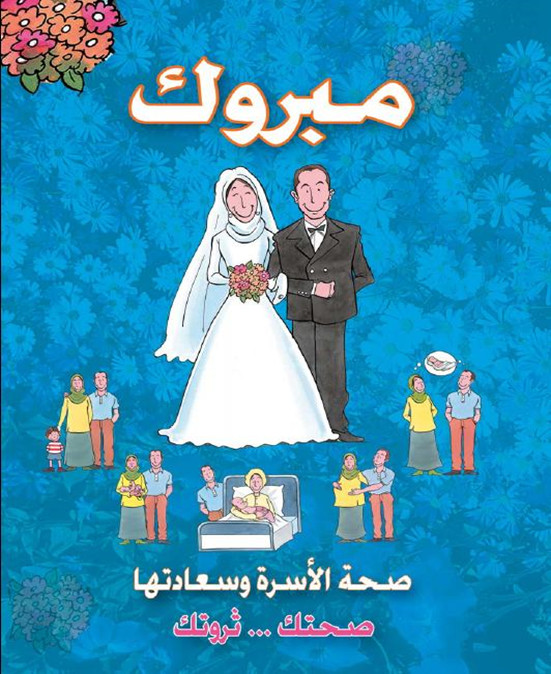 SBCC materials: On all health issues were distributed through health facilities, to couples who registered for marriage, and to participants of Mabrouk! activities and events. Magazine-format TV and Radio Shows: For young couples with children, featuring popular pediatrician, Dr. Mohamed Refaat. The Community Health Program: Trained community development associations to counsel newly married couples, prepare couples for safe pregnancy and birth, organize visits by outreach workers to the homes of women postpartum, and classes on infant and child health and nutrition. AskConsult offered classroom-style training to private-sector pharmacists and physicians. The daylong workshop taught providers how to effectively counsel their clients on family health issues. To increase the professionals’ health knowledge, the workshop included sessions on maternal care; and infant and child care including breastfeeding, weaning, nutrition, diarrhea and vaccination. The workshops also provides brief session on other topics commonly raised by clients such as blood-borne diseases and safe injection; avian influenza; reproductive health and contraception; and danger signs during pregnancy, after giving birth, and in the newborn. CHL monitored the reach of campaign activities and media through omnibus surveys and media surveys that were conducted on an annual basis, some of which are listed below. Progress was monitored through the Village Monitoring System database which included routinely collected information about prenatal progress, postpartum care, infant growth and malnutrition. CHL also conducted annual Egypt Communication Surveys from 2004 to 2006, and smaller Village Health Surveys in Minya and Fayoum. The MOHP informed CHL when new health issues needed to be integrated into the Your Health is Your Wealth campaign. 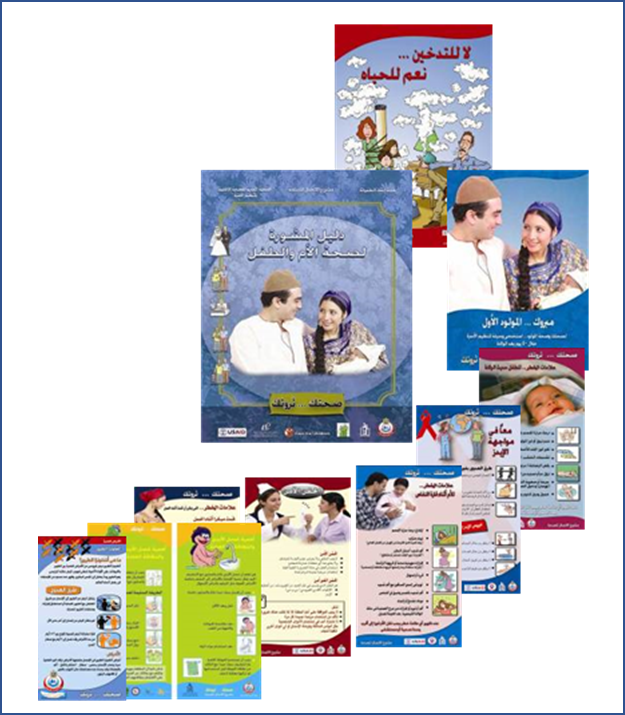 For example, during the first year as the campaign was just being introduced, the MOHP asked CHL to help address the issues of viral hepatitis B and C. CHL was able to quickly introduce a campaign for unmarried youth and young married couples on safe injection use under the Your Health is Your Wealth brand which ran concurrently with the Mabrouk! family planning, maternal and child health messaging. 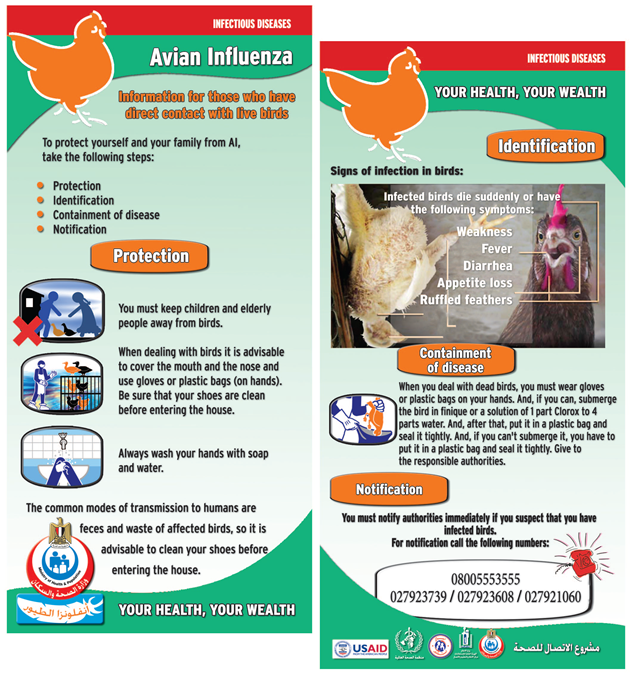 Avian Influenza (AI) made its appearance in Egypt in 2006, right in the middle of the CHL project's life. But the CHL team knew it was coming and laid the groundwork with a strategy for communication during influenza pandemics. The main goals of this effort were to contain the spread of H5N1 in both animal and human populations, to motivate rapid care-seeking by people if infection occurs and to support rapid diagnosis and treatment by health services. Two components of the national response were: the use of integrated risk communication and the consistent use of a risk and efficacy behavior change framework. CHL produced and distributed materials about handling of livestock, preventive measures, and what to do in the case of infection. The campaign included TV radio, press, announcements, flyers, Government of Egypt (GOE) website support, hotline promotion, press inserts and press briefings. Breast Cancer: In October 2009, CHL assisted the Breast Cancer Foundation of Egypt (BCFE) and Susan G. Komen for the Cure in managing and promoting high-profile events for Breast Cancer Awareness Month. CHL provided the full set of materials from sign-up forms to T-shirts and helped BCFE in producing informational pamphlets for breast cancer patients. Tobacco Use: As the GOE prepared to require labels on cigarette packets with startling images warning of tobacco’s harms to smokers and those around them, CHL provide key technical assistance, assembling potential images, pre-testing them with the public, and presenting recommendations. Female Genital Cutting: CHL aided the GOE’s campaign to stop doctors from performing female genital circumcision (FGC). CHL held seminars for 3,300 final-year medical students and trained 250 doctors from around Egypt to raise awareness among doctors and communities about the harms of FGM/C under the initiative “Doctors Against FGC." Health Reform: The Family Doctor: In 2004, in response to a request form the MOH, CHL initiated a campaign aimed at promoting the concept of the Family Health Model to the general public and community leaders, emphasizing service quality, counseling, patients’ rights, and women’s services. 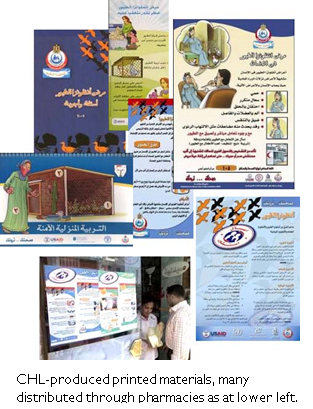 Egypt Health Communication Survey (EHCS), 2005, carried out in 21 governorates to measure respondents’ recall of health communication messages, knowledge and practices in areas related to reproductive health and family planning, some infectious diseases, healthy lifestyles and passive smoking. Egypt Health Communication Survey (EHCS), (July) 2006, to measure recall of health communication messages, knowledge and practices in areas related to exposure to media channels and avian flu campaigns, knowledge including the mode of transmission of the avian flu virus, reporting avian flu cases as well as exposure to health messages. Egypt Health Communication Survey (EHCS) 2007/2008, to provide information about health knowledge, attitudes, practices and behaviors, including intensive questions related to exposure to Avian Flu massages. Minya Village Health Survey (MVHS) 2005, to monitor implementation of the CHL project and to provide data that could be used to modify project activities, if needed. Fayoum Village Health Survey (FVHS) 2005, to provide estimates for key indicators that would assist the technical staff at the CHL project to design new communication strategies and activities for improving the health status of Egyptians. Minya and Fayoum Village Health Survey (M&FVHS) 2007-2008, village health survey, the last round of a panel study with respondents in the selected Minya treatment villages and Fayoum villages. Breast Cancer in Egypt: Preliminary Situation Analysis with a Focus on Early Detection, to estimate the disease burden, incidence, mortality, age groups at risk and other epidemiological aspect of breast cancer in Egypt. AskConsult Providers Survey Report, 2009, to evaluate the effectiveness of activities which are aimed at improving the credibility of pharmacists as the source of accurate health information, reducing the costs of pharmacy management, and increasing sales of products in promoted categories. CHL evaluated the Mabrouk! Initiative using EDHS data from 1995, 2000, 2005 and 2008. It evaluated the Community Health Program through monitoring data collected systematically by project partners. Campaign reach and recall of CHL campaign activities was high (Hutchinson, 2010; Meekers and Nauman, 2006b), as can be seen in the chart below. Women increased reproductive health practices that lead to better outcomes for themselves and their babies that were promoted in CHL communication campaigns. The EDHS showed significant increases from 2005 to 2008 in the behaviors promoted by CHL national campaigns. Improved program management has been evident as a result of capacity strengthening efforts in the GOE. CHL partners increased awareness of prevention and response to two influenza epidemics, H1N1 and Avian Influenza, and so kept the country’s flu fatality rates among the lowest in developing countries. Infectious disease control behavior improved as safe disposal of syringes, the subject of a series of CHL campaigns, increased nationally and in the communities of focus where CHL worked. Egyptians began to reduce societal tolerance of smoking. CHL helped the Ministry of Health select graphic warning labels on cigarette packets that became perhaps the country’s most pervasive communication intervention ever, with near-universal exposure. Training of 60,000 practitioners took place between 2004 and 2010 to carry out health communication activities including 22,000 in maternal and newborn health. CHL leveraged more than $7.2 million worth of cash and in-kind contributions in support of USAID health priorities with 27 private-sector companies that leveraged . The AskConsult activity also directly produced a sustainable entity, AskConsult for Health LLC, an Egyptian not-for-profit corporation that began developing non-USAID-funded health communication partnerships even before the end of the CHL project. AskConsult directly trained 5,500 private-sector pharmacists in interpersonal communication to build their capacity to fulfill customers’ demand for credible health information. AskConsult provided fact sheets, e-mail newsletters and online training modules its affiliated network of 30,000 privately-owned pharmacies. As part of the CHL project’s original technical approach, and in keeping with USAID’s proposed exit strategy, CHL in 2008 established the independent not for profit AskConsult for Health organization to carry on health communication activities and grow partnerships. Like the AskConsult activity, the mission of AskConsult for Health LLC is to grow the market for health through strategic partnerships that improve access to critical health information and products that meet the needs of Egyptian families. Additionally, AskConsult for Health implemented contracts for capacity-building and marketing campaigns in other countries in the Middle East so as to share the Egyptian experience of strategic health communication throughout the region. For example, AskConsult for Health began conducting capacity-building workshops in Libya under an agreement with the National Center for Disease Control. In addition to spreading the benefit of the USAID investment, these activities show evidence that the field of strategic health communication is valued among public health professionals in the region.